These orange silica gel beads turn green when they have absorbed maximum moisture. They can be mixed with our bulk silica gel to provide an economical method of using silica gel and still have the benefit of the indicating beads to let you know when they need to be replaced/recharged. Available in 1/4 lb and 2 lbs bags. This product does not contain Cobalt(II) Chloride. Q. 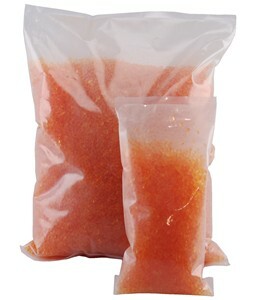 What size are the orange silica gel beads? A. The silica gel beads vary between 2.0 to 5.0 mm in size. A. Yes, they can be placed in an oven at 240 degrees for at least 3 hours to dry them out (they will turn orange again), then put back to use. A. They will turn green.